PANSPACIFICFLIGHT five-year-old gelding Little Rascal has been transferred from Robert Dunn’s Auckland training base to his Woodend Beach stable in Canterbury ahead of the Cup meeting at Addington next month. 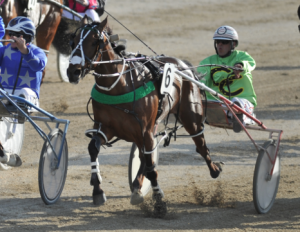 As the winner of seven races, Little Rascal is well-placed in a C3-5 mobile over 1950 metres at Addington on Friday night. He has had two unplaced runs at Alexandra Park this campaign, blocked for a run in the straight in the first and losing his chance at the start in the second. Owned by Christian Cullen’s owner Ian Dobson, he was a winner on Show Day at Addington last year. With earnings of $96,000, Little Rascal is poised to become the second of Panspacificflight’s progeny to break the 100k mark in New Zealand. Four-year-old mare Arden’s Choice, who starts in the Kerry Hoggard Memorial–The Holmes DG Pace at Alexandra Park on Friday night, has won $223,000. THE BREEDING SEASON is under way at Macca Lodge with the first half dozen foals already on the ground and a record number of mares — about 250 — due to foal there this spring. The McIntyres have taken on extra staff because of the higher number of broodmares on the property following the closure of Kina Craig Stud, which also had a 24-hour foaling watch. MACCA LODGE has taken up sponsorship of the passing lane at Ascot Park for the three Northern Southland meetings there this season. Reciprocity, by Panspacificflight, was an appropriate winner at the last club meeting there. Not that the three-year-old filly needed the passing lane — she was in front and cruising on the turn. One of the most impressive qualifiers in Southland so far this season, Panspacificflight three-year-old Katchmeifucan, has been snapped up by Australian buyers. He’ll race as Lets Katchmeifucan across the Tasman. The Nathan Williamson-trained gelding scooted his last half in 56.3 when he qualified in 3:04.4 at Wyndham on 14 September, beating a well-bred filly in Clark Barron’s team, Somejoy (Somebeachsomewhere-Jumpforjoy), by more than three lengths. Panspacificflight has a strong following in Australia through the performances of New Zealand-bred progeny like Glenisla, Sir Mac’s Man, Last Flight In and Straight Thru Blue. Katchmeifucan is out of three-race winner McKenzie Jaccka, a McArdle mare from the Josephine Bret family. SOUTHLAND AND OTAGO horses will compete for a $30,000 stake in the 2016 running of the Macca Lodge Trained South of the Waitaki race at Addington on Show Day in November. This is the third year the race will be run exclusively for southern-trained horses, but there are some changes this time. The stake has been boosted $10,000, the distance has been reduced to a 1950-metre mobile and three-year-olds are now eligible for the race for C1 and C2 pacers. Won last year by the Nathan Williamson-trained and driven Statham, the race builds on the success of the Macca-sponsored winter series at Addington in July. Brent, Sheree and Caine McIntyre are delighted to be associated with the race again. 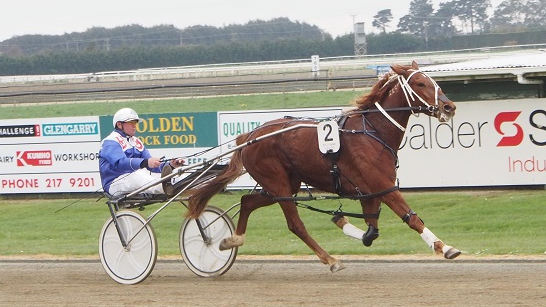 RECIPROCITY — pronounced Reci-procity not Re-cipro-city, as the Trackside commentators would have us believe — became the first winner from Panspacificflight’s third New Zealand crop with a stylish front-running win at the Northern Southland meeting at Invercargill on Saturday. Brent Barclay hunted the three-year-old filly to the lead after about 400 metres and she won the way a $1.80 shot should. She sprinted her last 800 metres in 57.1, with a final quarter in 27.4, and posted a time of 2:44 for the 2200 metres mobile. Owned by Invercargill solicitor Lester Smith, Reciprocity is a full-sister to Sally Maclennane who won one race in the Macca Lodge colours last season before being exported to Australia. They’re out of the six-win Badlands Hanover mare Weka Lass, a daughter of the Chariots of Fire winner Oaxaca Lass. West Australian winner Straight Thru Blue is bred on the same cross. The double up in the blood of Western Hanover — the sire of Badlands Hanover and the grand-sire of Panspacificflight — is obviously serving breeders well. You can read Bee Pears’s blog on Reciprocity here.